A durable bag for the daily grind with this adidas Linear Sports Backpack in Black and White. 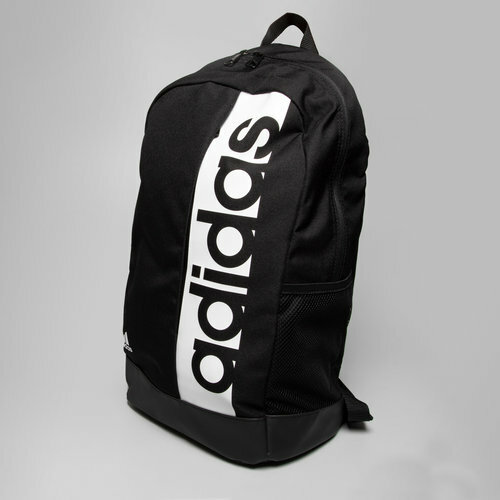 This adidas backpack is perfect for everyday use and haul your items around between work, the gym and training. Made from durable woven polyester with a laminate base this backpack is sure to be hanging around for a long time. The fabric that this bag has been crafted from protects against any moisture on the pitch or changing room floor. This bag comes with an inside divider to help you separate and organise your items in a sufficient manner. It comes with padded, adjustable straps for the wearer to dictate comfort and a large compartment for carrying and organising as many belongings and storage items as possible.